Roasted duck sautéed with bamboo shoots, onions, bell peppers, and spicy chili sauce then topped with crispy sweet basil leaves. Soft and tender sirloin beef stir-fried with the chef's special spicy sauce, bell peppers, onion, tomatoes, and pineapple. 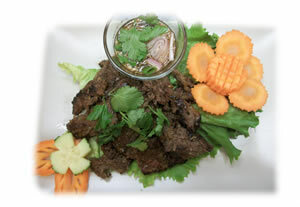 Grilled sliced beef marinated with fresh lemongrass then topped with spicy lime dressing and served with cucumber slices. B.B.Q. chicken marinated in coconut milk and Thai spices then served with sticky rice. Grilled chicken marinated with fresh lemongrass, garlic, white pepper served on steamed spinach and broccoli then topped with our house peanut sauce.